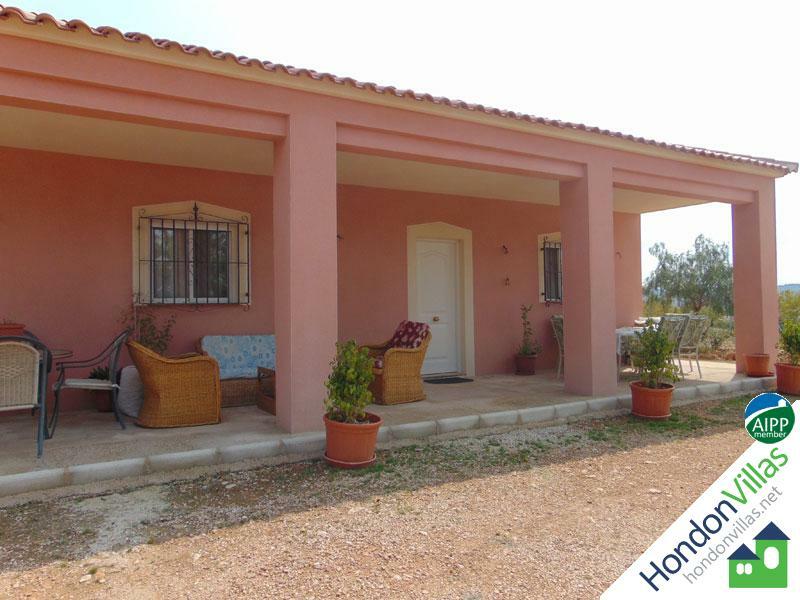 Hondón Villas are delighted to bring onto the market for sale this semi-detached 2 bedroom 1 bathroom Finca with private garden and large 60m2 rooftop solarium, situated just a short stroll to the centre of the pretty village of Macisvenda with all the amenities, and with spectacular countryside views. This delightful Spanish style Finca has a gravelled driveway around the side of the property and a private walled garden in front with Jacuzzi. Inside the Finca it has kept the traditional style with beamed ceilings and tiled floors. Downstairs on entering the property you will find a large fitted kitchen with walk-in pantry, a separate dining room (that could be a third bedroom), a large full family bathroom and two double bedrooms. Upstairs there is a large lounge area with doors leading out to the 60m2 rooftop solarium boasting spectacular 360 degrees views of the village and surrounding countryside. 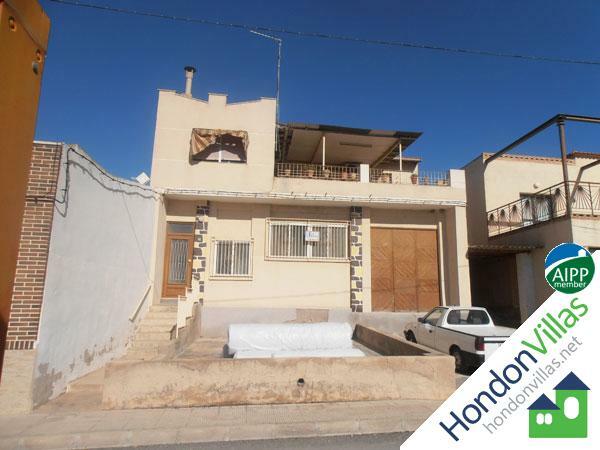 Situated just a short stroll from the pretty village of Macisvenda in Murcia with all the amenities this Spanish style Finca will make the perfect home and at this price will not be on the market long!!!! 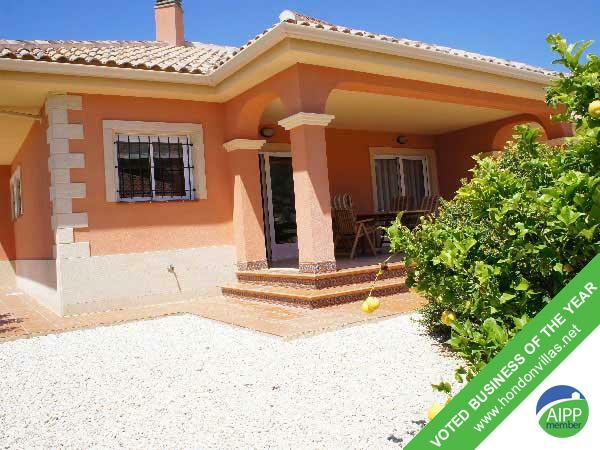 Hondón Villas are delighted to bring onto the market for sale this large two-storey detached villa on the popular urbanisation of Santa Elena. On the ground floor you will find a beautiful lounge/dining area with fireplace leading out to a covered naya and terrace. There is a fully fitted modern kitchen with island, and also a downstairs W/C. Upstairs there are 2 large bedrooms with fitted wardrobes. A very large master bedroom with separate dressing room, en-suite bathroom and large balcony and a family bathroom. All the windows are double glazed and the house is fitted with an alarm system. Outside the gardens are well maintained, and there is a large driveway that will park two cars with electric gate. There is no pool but plenty of space to have one installed. 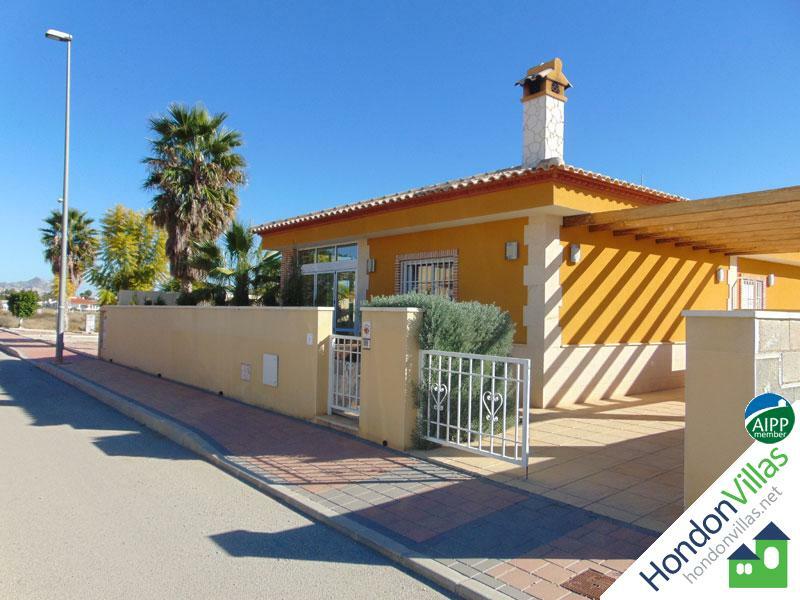 Hondon Villas are delighted to bring onto the market for sale this detached 3 bedroom 2 bathroom villa in the pretty village of Barbarroja. The property is sold as seen and just needs walls and ceilings plastered and a kitchen fitted. The gardens are well maintained and there is plenty of room for a pool and or garage. At this price the property will not be around for long so book your viewing now!!!! 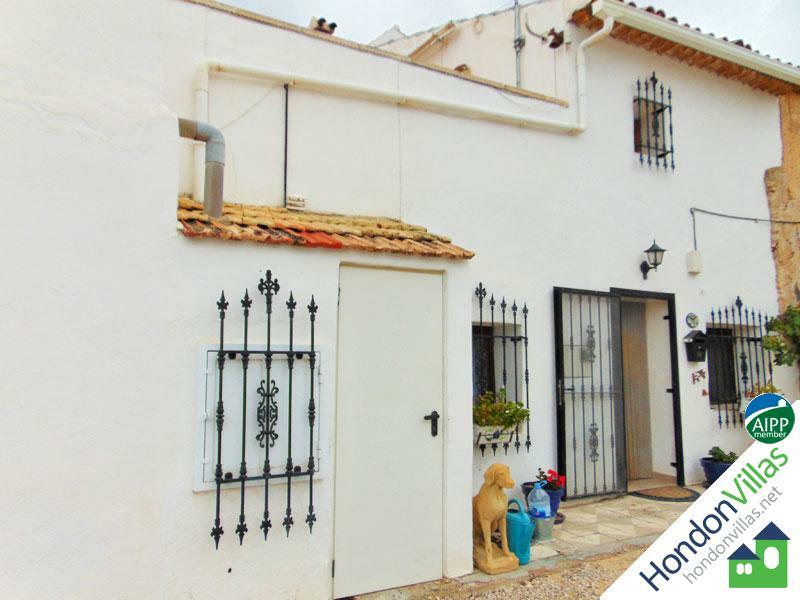 Hondon Villas are pleased to bring onto the market for sale this town house in the Village of La Romana. The property comprises of a fitted Kitchen, lounge/dining room with log burner, 3 good sized bedrooms, and one family bathroom. Outside is a small garden area, that is fully fenced. and must be viewed to be fully appreciated. 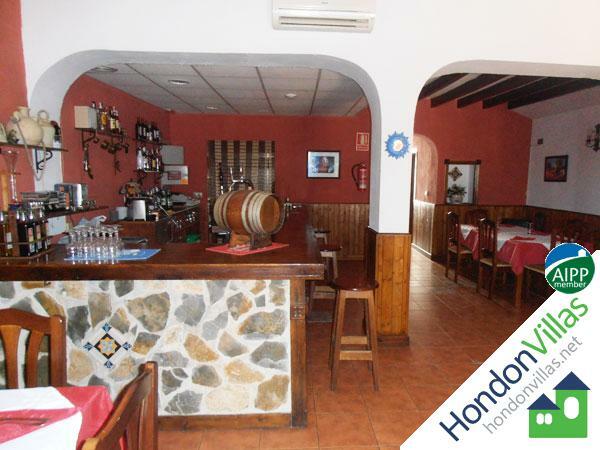 Hondon Villas are pleased to offer on the market this commercial building. This building has a large factory that used to make furniture, but could be used for anything. Above is an apartment with a fitted kitchen, lounge, 4 bedrooms and One bathroom, it has hot and cold air con in the lounge/dining room. Also there is a balcony that has enough room for a small seating area. This property would suit somebody with a business. 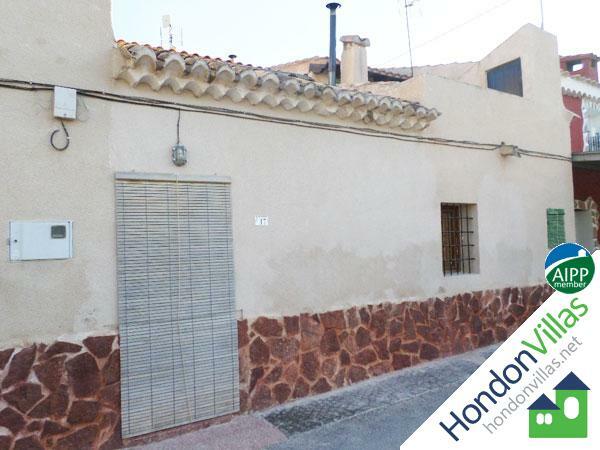 Hondon Villas are delighted to bring onto the market for sale this property situated on Las Kalendas which is a quiet and well kept urbanisation on the outskirts of the busy town of Fortuna and within easy walking distance of the famous salt baths. 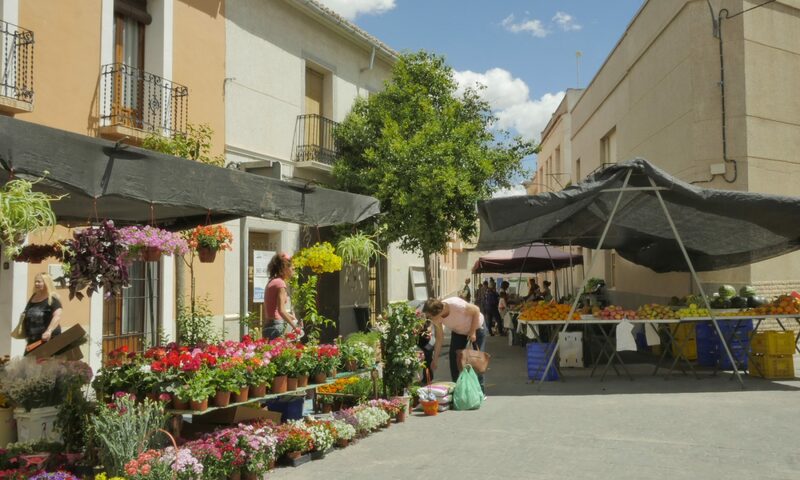 The urbanisation boasts many facilities including an Indian Restaurant, a veterinary surgery and a Spanish Bar along with 3 community swimming pools. LOUNGE/DINER – a good size room with feature fire place and strategically positioned TV points to allow for multiple furniture layouts. The lounge/diner has access to a porch which has glass doors that can be closed to provide a fully enclosed room or fully opened to provide an open terrace. KITCHEN – There is a separate kitchen fully fitted with space for dish washer and fridge freezer. There is also a small utility room accessed separately housing washing machine and dryer. BEDROOMS – The property has 3 good size bedrooms the master being en suite. BATHROOMS – In addition to the en suite there is a family shower room. EXTERNAL – Externally the property has a wrap around garden area that is mainly tiled and offering various options for relaxation. There is a built in BBQ area and room for a plunge pool/jacuzzi to be installed if required. SOLARIUM – There is a good size solarium on the roof which houses the solar water heater and TV dish but with ample space for other uses also. VIEWS – The property offers panoramic views of the urbanisation and the surrounding countryside from all sides. Hondon Villas are delighted to bring onto the market for sale this Detached Villa with guest apartment and private swimming pool and car park, with 7 bedrooms and 4 bathrooms this would be an ideal opportunity for a B&B or small hotel, situated just a short stroll from the famous Thermal Spa baths and a few minutes drive to all the Amenities of the bustling Town of Fortuna. On the ground floor you will find a large hallway with entrance on both sides both leading to on one side a private terrace area with street entrance and the other side the main entrance through the terrace surrounding the pool. Also on the ground floor there is a very large kitchen that is suitable for the running of a small hotel or B&B, a nice private lounge area and stairs leading to the first floor and also a doorway leading down into the guest apartment. The guest apartment is being sold fully furnished and has A very large lounge/dining area with a fully fitted kitchenette on one side with American style breakfast bar. There is also two double bedrooms and a large family bathroom. On the first floor you will find two double bedrooms both with en suite facility and fitted wardrobes. The second floor has two double bedrooms and a single bedroom. There is also a shower room and separate W/C, on this floor you will also find some handy storage spaces and a terrace/solarium boasting spectacular views of the surrounding countryside. Here is another lounge area that could be used as a bedroom and rooftop solarium. The property also has a cellar/under-build that could be converted into more accommodation or make a fabulous games room. Hondon Villas are delighted to bring onto the market for sale this detached villa only a couple of minutes from the local village. 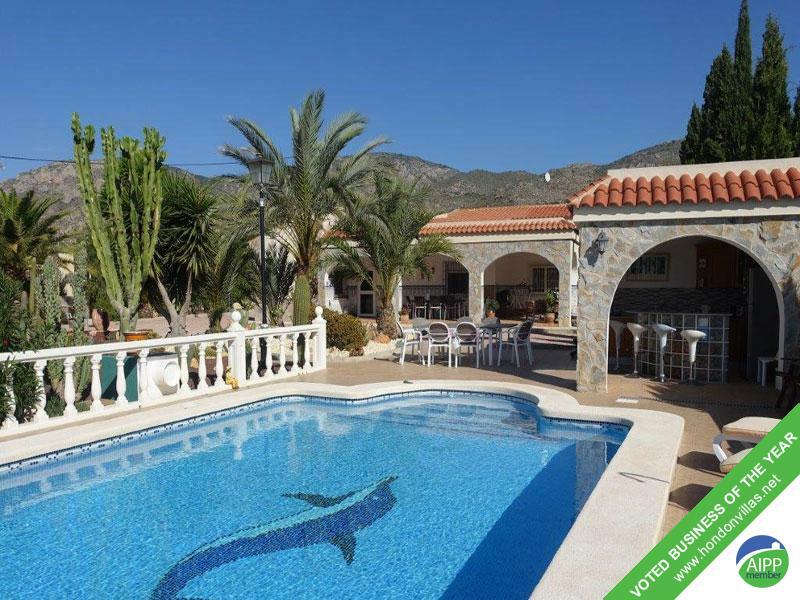 The villa comprises of a brand new modern fitted kitchen, separate pantry, lounge/dining room with beautiful views of the garden and mountains, 2 large bathroom both with en-suites and a toilet. The plot is an easily manageable 420m2 and is completely fenced. There is ample space for the installation of a swimming pool. The villa benefits from air conditioning in all the rooms, halogen heating and the property is sold with all interior and garden furniture. 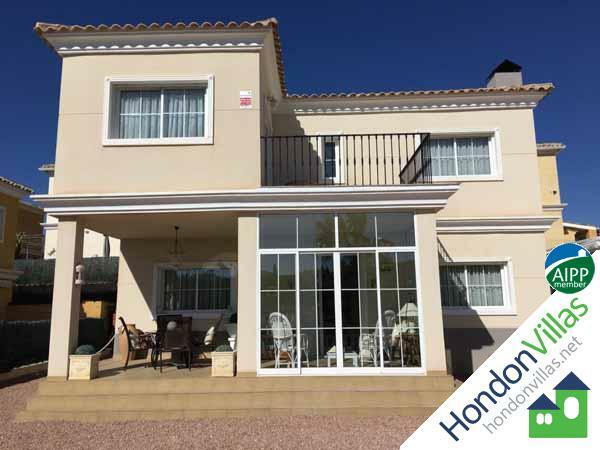 Hondón Villas are delighted to bring onto the market this lovely detached villa in the Crevillente mountain range. Surrounded by panoramic views the property comprises of 3 bedrooms, 2 bathrooms (one En suite), attic, Hot&Cold A/C, mains electric and also mains drinking water and irrigation water. The 2.200m2 fenced plot counts with an automatic gate, a barbecue area, private swimming pool with bar area and external bathroom, storage room, exterior lights throughout the plot and beautiful gardens with an array of trees to provide fruit and shade.